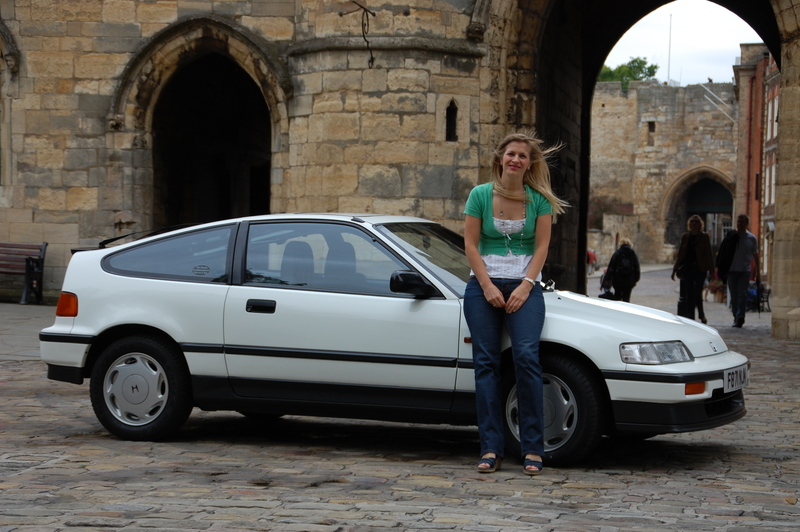 In the first Tomorrow’s Classic feature, Marie Appleyard shows off and talks about her fantastic Honda CRX. Marie lives near Lincoln and uses a Peugeot 107 as her daily driver. “Most car enthusiasts can remember the first time they saw the car of their dreams and I’m no different. It was one of my first days at work in a bank in Sheffield. My route took me from Dronfield Woodhouse and along Chesterfield Road to work, where I went past Peter Brooks Honda each morning. There, looking gorgeous and gleaming in the showroom window, was a Celestial Blue CRX VTEC. I knew then that one day, I’d have a CRX. 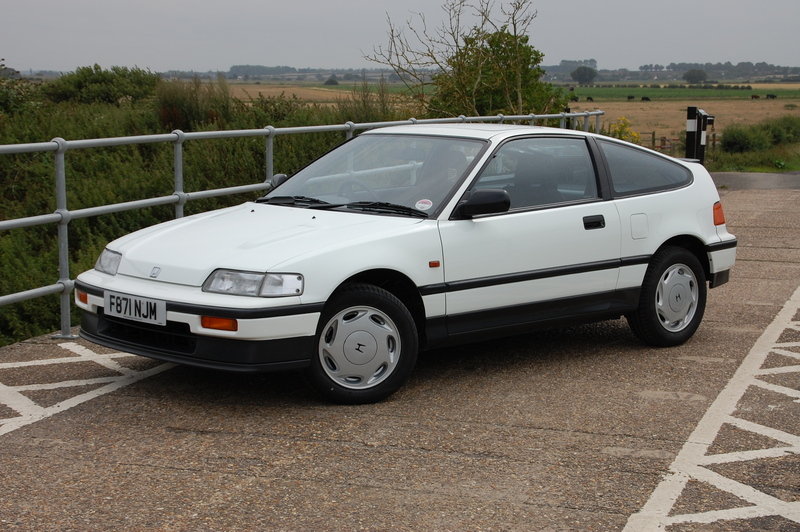 In fact, I’d saved up money for a deposit on a house at the same time – if the sale had fallen through, I’d have blown it and had that CRX. Unlike my journey to work, my path to owning one was actually a long one. Like most people, other life commitments and circumstances mean that things like owning a dream car tend to come a little later on, but that desire to have a CRX never went away. Even when I did start to look seriously, it wasn’t a quick process. There were CRXs for sale all the time but not one as solid and original as I really wanted. Initially I was resolutely focused on a later VTEC, but the more I looked the more I found that they had either had a really hard life, were modified beyond my tastes or were so well looked after they were right out of my price range. Eventually, after two years of hunting, I found the one I wanted – a very straight 1.6i-16 model on an F plate in white, one of the two best colours for a CRX in my opinion (as well as the turquoisey Celestial Blue). The advert stated it was down in London but I knew I couldn’t get there until the weekend, so I rang up the seller. She confirmed that the bodywork was essentially straight and essentially rust-free, so with everything else sounding brilliant, I sent her a cheque as a deposit and arranged to go down to collect it. Unsurprisingly, there was competition for it, and within hours a guy was ringing the vendor asking to buy it – with the cash ready. Thankfully, she honoured our agreement, told this guy where to go and held on for me to come down with the balance. I’m the third owner of the CRX – all ladies. The car was bought new on 1 November 1988 by Mrs Peppercorn who paid the sum of, a now very inexpensive-sounding, £8015.96. She ran it until she couldn’t afford to keep it up to the standard she wanted to and sold it in 2001 to Sharon Stickland. Sharon’s a CRX fan while her other half is a big Celica and Supra collector. They have a double-level garage and during her time as owner, it wanted for nothing, being restored back to its former glory. When I bought the car for £2000 from Sharon in August 2008 it had done, 97,000 miles and was in great condition. 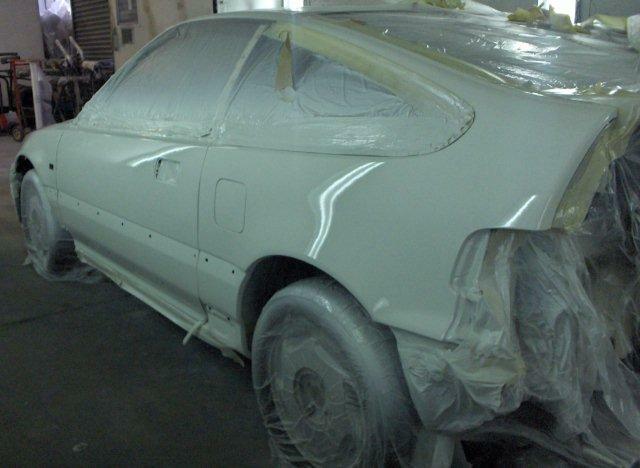 For the money, it was the best CRX I’d seen, so naturally I was ecstatic. The timing was perfect – my dream car as a birthday present for myself too. In the three years and 4000 miles I’ve been CRXing, I’ve tended to run it in the warmer half of the year and keep it SORNed during the off-season. It’s too good to risk taking it out when the roads have been salted and the icy rural roads of Lincolnshire are asking for trouble in a car that’s so much fun to drive fast. Insurance, on a classic, restricted mileage policy is less than £170 with an agreed value now of £3000. The only stipulations are that it’s been fitted with an immobiliser and it’s garaged every night – which it is, and always chamoised down if it’s been raining. I’ve not got the time or inclination to get it up to concours standards but instead like to use it as a really good condition car that can be, and is, driven, not kept pristine like a museum piece. That said, in the time I’ve had it I’ve spent £1500 on it so far – I don’t consider £500 a year too expensive a hobby. So far I’ve had the alloy wheel centre caps refurbished and had the bodysides and bonnet taken back to bare metal and resprayed. The kart-like handling is something CRXs are famous for and although mine was fun, it always felt a little twitchy at the limit, not giving me all the confidence I wanted at the wheel. New components on the double wishbones, replaced bushes and a set of tyres transformed it though. It grips brilliantly now around the sweeping bends of the village back roads near where I live, changing direction quickly and responsively. It handles really well too and although very responsive, the ride is not ridiculously hard or bouncy. It really is a car you can easily use every day and it’s a hell of a lot of fun. I’m planning to have more work done next summer. The bumpers now look a little bit shabby compared with the body sides and bonnet so I’ll get them sorted out. The sunroof, a common CRX weak spot is also on its way out so I’ll need to replace that. Some owners replace them with a fibreglass alternative but I hope to replace it with another metal one. It’s only small because of the CRX’s tiny roof area, and the wind noise is terrible when open at any decent speed, but hey, it works! 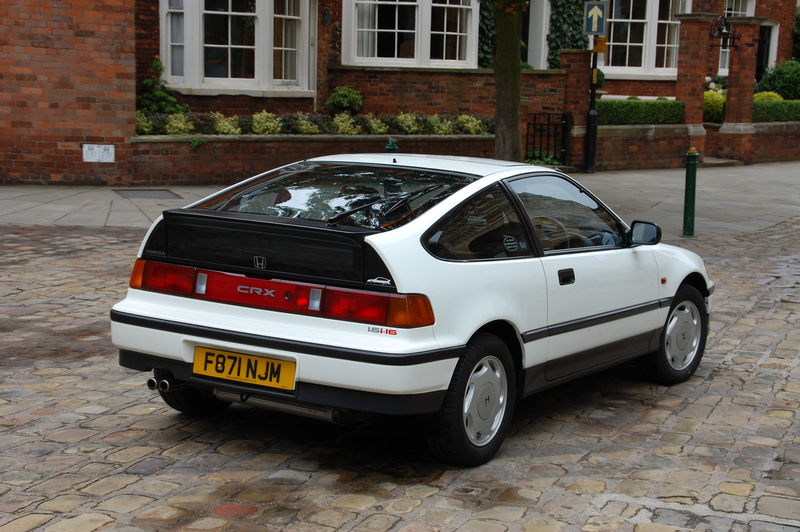 The look of a car is always a subjective thing but for me, the CRX is beautifully simple in its proportions. A great looking, lithe, small car with elegant, thin pillars, very low front wings due to the double-wishbone suspension, slim headlights with no grille between them, a subtle bonnet bulge and that glorious Lamborghini Espada-style split rear window – Citroën recently had a similar thing on the C4 Coupé, of course. There’s a really funny Japanese advert from when the car was on sale and that extra rear window’s mentioned as a selling point! Inside, it’s in equally good condition but very much an ’80s child in terms of décor. The seat centres are a soft stripy material, whilst the bolsters are clad in a grippy velour. This velour extends along the door panels and wraps right around the dashboard. 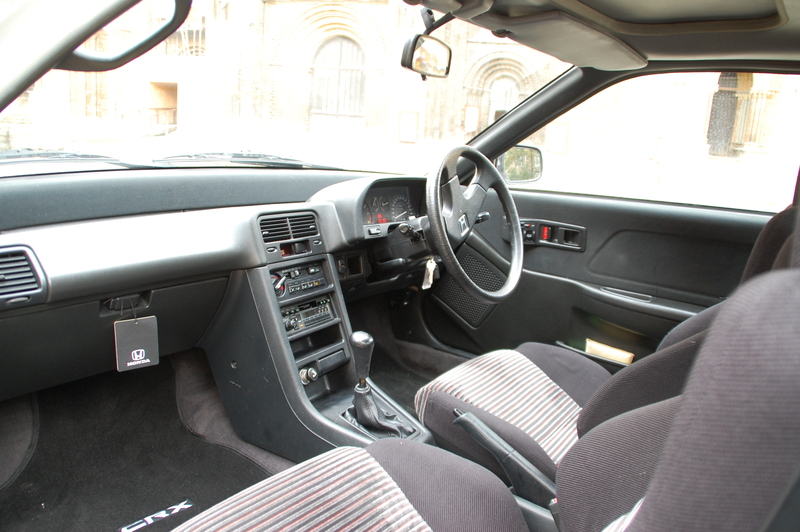 The dashboard itself doesn’t have the squidgy plastics of modern cars but its style isn’t too dated. There’s loads of electrical equipment too, as well as the original radio cassette player. Actually, apart from the ability to hook up with an MP3 player, the only thing really missing that would make it perfect is aircon. You sit really low inside too, making it feel very sporty. It can feel a little disconcerting sat alongside modern cars, like the Peugeot 107 I use as a daily drive, because cars have all become taller and bulkier. 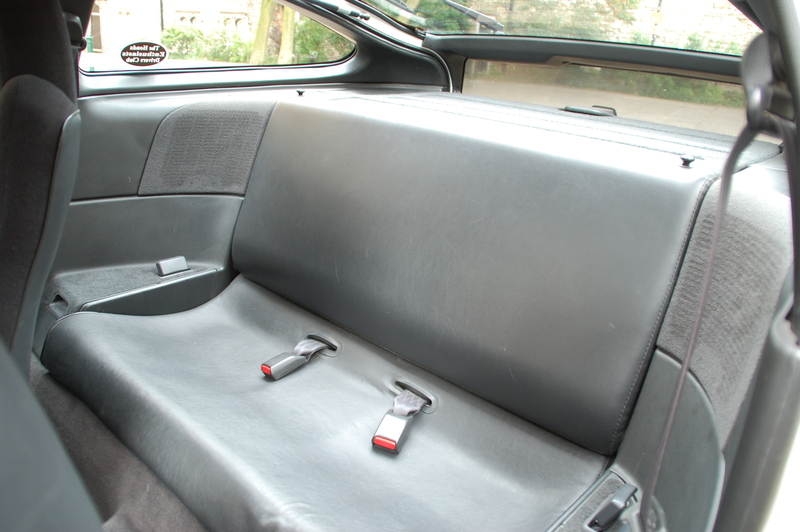 You can only really consider it as a two seater though – there are rear seats but it’s really nothing more than a vinyl bench, only suitable for little kids or contortionists. Best to think of it as a second boot! But I love it, as in really love it. This is a proper ‘old skool’ car. Yes, these electric gizmos inside help make it feel relatively modern but the mechanicals are a revvy 1.6 twin cam engine with a 7200 red line, a slick manual 5-speed box, and unassisted steering. You can feel everything the car’s doing and you feel at one with it – it’s an extension of you and that’s why it’s so addictive. The handling is like the clichéd go-kart set up you read about, like a really well sorted old Mini Cooper but moved on to late 80s standards of performance and reliability. You know, someone could offer me a Ferrari of the same age as the CRX in a straight swap but I’d want to stick with what I’ve got. She’s a keeper. I’ve had my head turned by other cars: I saw one of the first Fiat Coupés in Britain in the mid 90s. It was a Turbo in Broom Yellow and it overtook me on the Woodhead Pass. They look stunning but the unreliability of them really puts me off. I can see why people buy them but in my life, the CRX is a better all rounder. Can I recommend a CRX to anyone else? Definitely! You need to decide what you want though because there are less than 900 or so left and they’re becoming increasing popular with younger lads who recognise their handling abilities and performance for the relatively low cost. Many get rapidly turned into cars which appear to be ready for track days, meaning good, standard examples are becoming rarer, and therefore prices are slowly climbing. The main areas to watch out for are rusting wheel arches and around the sunroof opening. Also, check all of the electrical equipment works properly, as there’s quite a bit of it in a car over 20 years old. Other than that, the only faults I find tend to be rattles and squeaks in the plastic, but a few carefully placed felt pads help keep these annoyances down. I love taking the CRX to car shows and letting it get attention – people are always very complimentary about its looks and condition which gives me a buzz, thinking “yeah, they’re on about my car!” At one show it outdid an NSX in terms of attracting a crowd. Great shows to go to are the Japanese Auto Extravaganza (JAE) in September at Wicksteed Park in Kettering and the Jap Fest shows. There’s always lots of great looking standard and modified Japanese cars and all the guys are really friendly and supportive of one another’s efforts. 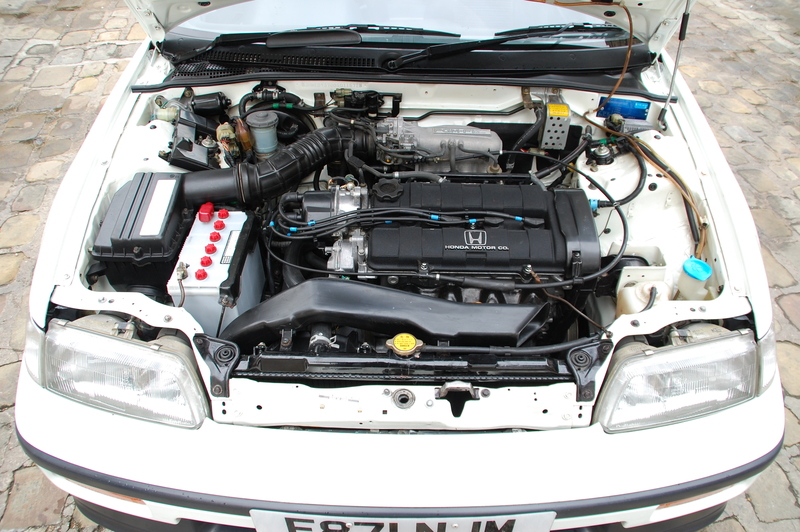 There’s also a huge amount of support and advice on forums for owners and prospective CRXers, one of the best being www.hondacrx.co.uk. If you’re serious about CRXs, then get on there before you part with any cash – it might stop you from buying a lemon. As I said before, this one’s definitely a keeper. The only time I’d ever consider selling it would be if it dawned on me I wasn’t enjoying driving it any more but I can’t imagine that ever happening. If I came into a significant amount of money, like a huge lottery win, I’d buy as many CRXs as possible and save them from the scrapper, that’s how much I rate them. Had 2 of these in the past. A 1.6-16 and a VTEC. Can only agree best car in the world. Miss them terribly and am looking for a good one at the moment.